Use this HIC-1 cord to connect any Plantronics H or HW series headset directly to your Avaya telephone headset port. This provides you with "on-hook" functionality so that you won't have to lift your telephone handset off the receiver for every call when using your Plantronics headset. Only purchase this cable if you have one of the phone models listed below. 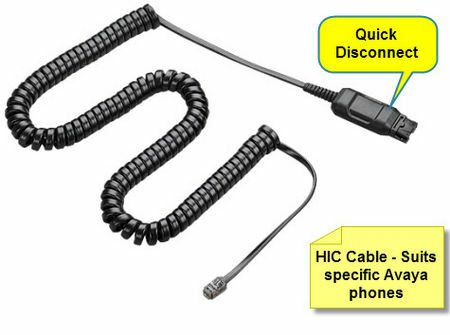 This cord is all you need to connect your Plantronics H or HW series headset to your phone. The cord has a modular plug at one end (to connect to your Avaya phone) and a QuickDisconnect at the other end which connects to any Plantronics Call Centre headset. For Avaya 9600 and 1600 series Deskphones you need the HIS cable.